A classic 1948 Jaguar Mark IV sports saloon, first owned by Arthur Whittaker, the Deputy Chairman of Jaguar Cars, has been re-united with his family 67 years after he parted with it. The Jaguar MKIV on auction preview day at Brooklands. During Historics at Brooklands classic car auction in Surrey on Saturday, 4th March, Whittaker’s four granddaughters – Lucy, Sally, Sarah and Charlotte – who discovered the car’s impending sale purely by chance a fortnight earlier – fought off rival bidders to make it their own, settling on £70,000 for the striking post war classic. Arthur Whittaker’s Jaguar and granddaughters Lucy, Sally and Charlotte (from left). It will now return to the eldest granddaughter Lucy’s family home in Kenilworth, just miles from the former Jaguar factory in Brown’s Lane, Coventry where it was originally manufactured 69 years ago. “Once we discovered grandad’s Jaguar was for sale, we just had to go and see it”, said Sally. “We had no intention of buying it, but sitting in it before the sale brought back so many fond memories of family outings in his cars that we decided we just had to bid for it,” she continued. Lucy and Sally sitting in their Grandfathers old car on auction preview day. As Deputy Chairman of Jaguar Cars, their grandfather got a new car from the company every two years. So his Jaguar Mark IV was only in the family for a short time, before being moved on after the next Jaguar came along. But it left a lasting impression on the whole family, which was captured in old family photographs brought to the auction by sisters Lucy and Sally. Little did they know that the next day, their Grandfathers car would be reunited with the family once again. After Whittaker parted with the car in 1950, it passed through the hands of a number of owners before a complete, meticulous restoration started in 1982 by the owner of the day. 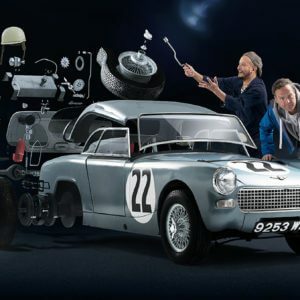 Twenty two years later the car was finally completed, latterly by classic Jaguar specialist, David Davenport, returning it to its spectacular condition that remains today. The Jaguar Sports Saloon was restored to a very high standard. 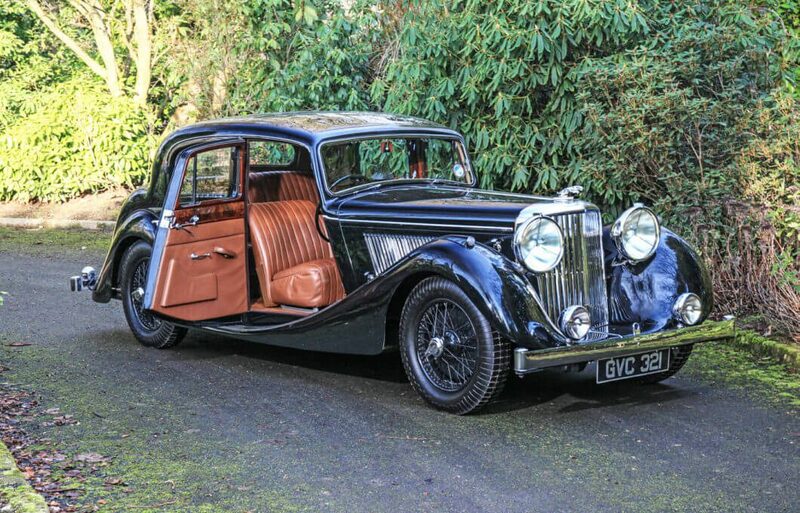 A supreme tourer in its day, Whittaker’s Jaguar Mark IV was one of the last to be produced. It was specially trimmed in pigskin hide, complementing the stately burr walnut dashboard and fittings, and left the Brown’s Lane production line complete with a rare sunroof. Powered by a silky smooth 3.5 litre six-cylinder engine, the Jaguar Mk IV is revered for its graceful lines and magnificent presence, dominated by huge dinner plate headlamps flanking the imposing chrome radiator. Historics Next sale is on Saturday 20th May at Ascot Racecourse. Article Source MPH Communications. 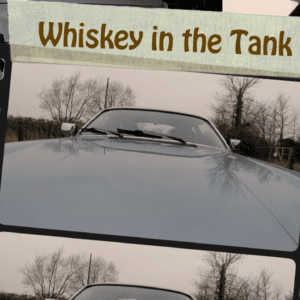 Photos by MPH Communications/Historics and Take to the Road. The interior was the height of luxury for its time. Appropriate for the Deputy Chairman of Jaguar itself. Lashings of wood and leather and the large steering wheel make it a wonderful place to sit. The detailing on the Mark IV burr walnut dashboard and the period dials is just wonderful. The Jaguar MK IV retained its substantial and impressive tool kit. They don’t make toolkits like this any more!